This 1960s-set, US civil-rights drama works brilliantly as both expert historical re-creation and a powerful reflection of what’s happening in the world right now. As recent events in Ferguson, Missouri show, there’s nothing ‘finished’ about the issue of racism in America or beyond. Fittingly, ‘Selma’, unlike so many great-man biopics, lures us into a web of unsettled arguments and shifting strategies as Dr Martin Luther King Jr (David Oyelowo) makes his landmark 1965 Alabama march a reality – at a terrible cost. The film plays like a great episode of ‘Mad Men’, pitch-perfect in its details yet totally lived-in: a universe of rolled-up shirt sleeves, sweaty brows and screams that sound horribly real. 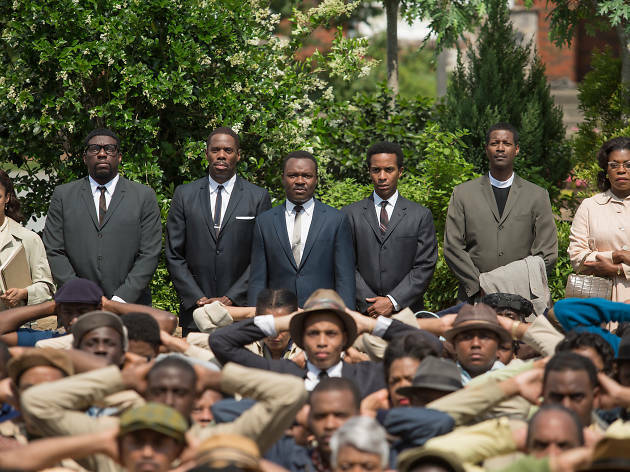 ‘Selma’ glides between moments big and small. Early on, the 16th Street Baptist Church bombing in 1963 – an act of homegrown terrorism that inspired King's drive to action that followed – isn’t announced so much as eased into, as four impeccably dressed girls descend a stairwell, chatting about hairdos. Then we see King grumbling about his fancy tie, helped by his soothing wife, Coretta (Carmen Ejogo), before walking out to accept his 1964 Nobel Peace Prize. His work is far from done: even as his team makes its way to Alabama to set up an HQ there, King’s reputation precedes him, and he's punched in the face in a hotel lobby. 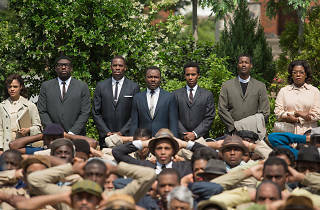 But ‘Selma’ truly takes off in the way it describes the back and forth behind great events. Oyelowo brings massive conviction to King’s rousing sermons but he’s even better in quieter moments, insisting to worried activists on the need for ‘drama’. The plan for a 54-mile march through scary backwoods develops over scenes, as does an equally riveting bit of gamesmanship between President Lyndon B Johnson (Tom Wilkinson) and racist Alabama governor George Wallace (Tim Roth, transfixing), who sketches out a shockingly pragmatic compromise. Complex performances dominate the film, all of them playing against the emotional bombast of an Oliver Stone epic. But director Ava DuVernay’s main achievement is her creation of a real and psychological state of unrest: of stifling heat, prison-cell doubts and spattered blood. Go now. I was recommended this film as a good one to watch for my new commute, and I watched it in three installments. I studied this era of history at school but my memory is such that I'd forgotten a lot of it. I found it to be a poignant movie, with some moments that brought me to tears, then to anger, then to 'how on earth did people think like that?' all in the space of minutes. An emotional rollercoaster for sure, but a worthy watch with fantastic actors to boot. I particularly liked the lady that played Dr King's wife, Coretta, she was brilliant. I slightly agree with the person below...too much of the happenings/plot are revealed these days in the Time Out reviews. I prefer the critiques that talk more about the acting or give wider ~"brush stroke" impressions..I did not find it "worthy" and not sure what that meant in this context The cause was worthy. The man was worthy. The people were worthy..so if it was a worthy film then good. Brighton UK where i live is a predominantly white town. I was pleased to see that black people did come out to see this movie, but sad to see not enough white people attend. The cinema was not full. A shame. Not the blood fest I was rather fearfully expecting thank goodness, but had me hiding behind my hands. Though I might not have been like that had I not be in row 6 near the front! Great acting. Moving without trying to hard. I guess those that have no interest in history won't attend. Roshkopf`s review is typically misleading. This isn`t a "biopic", it`s chiefly an account of one episode in history (the march from Selma to Montgomery) in which, of course, MLK was a pivotal figure. Neither is it a "Go now" movie; those who have no interest in political and social American history may find it worthy and tedious. Furthermore, for those who are unfamiliar with events, Roshkopf`s review half-spoils one of the many shocking moments in the film. Three and a half stars. Oyelowo is outstanding.